We’ll start by urging you to go to Gooding & Company’s website to check out more pictures of this awesome car. 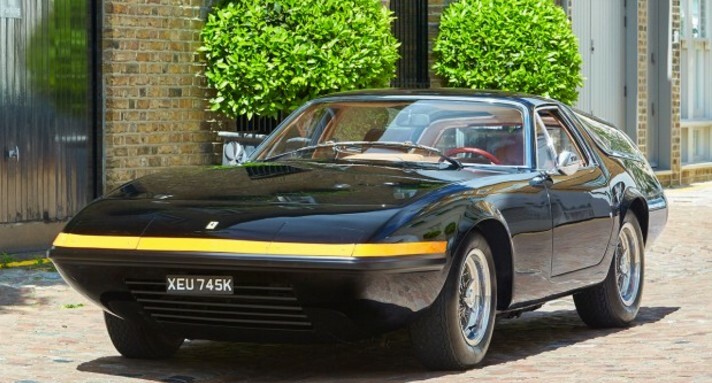 Sure, it’s a Ferrari Daytona, but it has been turned into a shooting brake – a two-door wagon. The rear section features a lot of glass, including a huge rear window and gullwing-hinged side glass that fold up. It’s astonishing. As a 365 GTB/4 this car is powered by a 4.4-liter V-12 making 352 horsepower. The design was actually done by Luigi Chinetti Jr. for a customer at his dealership. The body was built by Panther Westwinds, a manufacturer of sports cars in their own right. The first owner was a Floridian who surely enjoyed driving this mobile, black, glass greenhouse. It would have a few other American owners (and one Belgian). The current owner acquired the car in 2013 and had it completely restored. It has only covered 4,500 miles in its life, which is incredible. This unique one-off is expected to bring between $700,000-$1,000,000. Click here for more from this sale. This entry was posted in Uncategorized and tagged 1972, 365 gtb/4, auctions, cars, classic cars, daytona, ferrari, gooding & company, panther, panther westwinds, shooting brake, wagon by classiccarweekly. Bookmark the permalink.